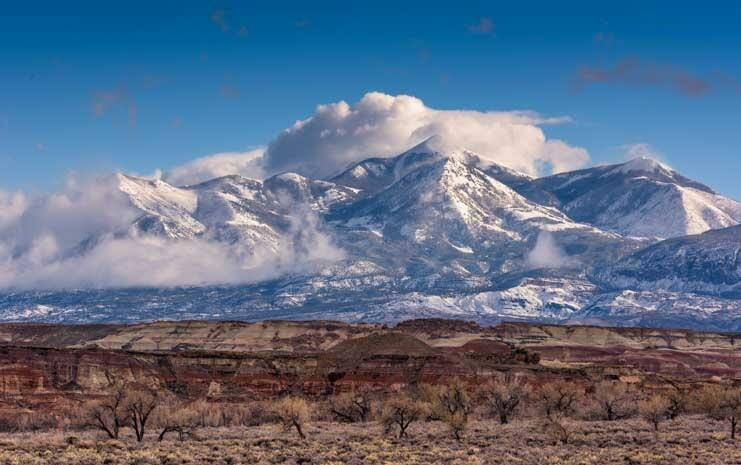 March 2019 – We arrived in southeastern Utah just as snow flurries were abating. It was unseasonably cold, but at twilight the Henry Mountains were utterly radiant, a visual gift that was a happy exchange for having to run around in hats and mittens in mid-March! We snuck out at the first light of dawn and found the red rocks were glowing with an inner beauty. 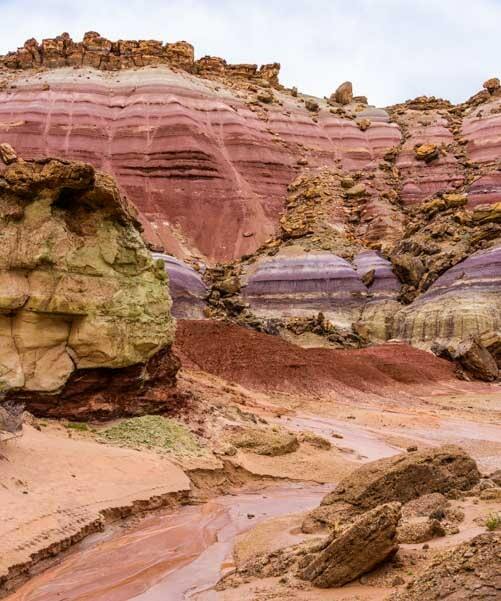 When a thick blanket of clouds filled the sky and chased the sun away for a few days, we could see the myriad of colors that are hidden in many of the exotic rock formations. Off in the distance the classic desert mesas led the way to the horizon in receding layers. 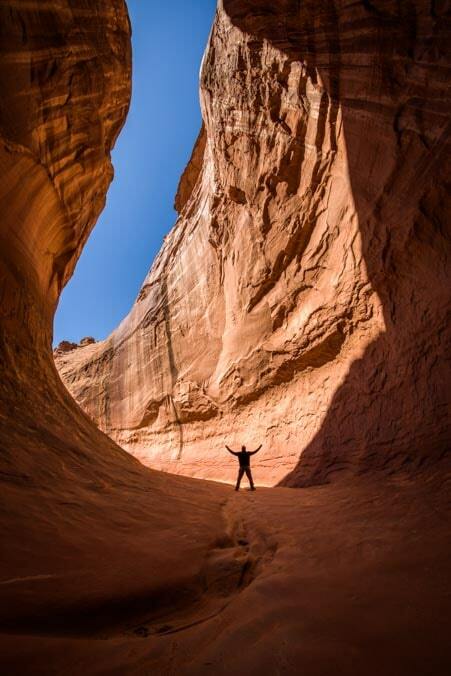 An excursion to the Dirty Devil River revealed an immense canyon reminiscent of tributaries within the Grand Canyon. 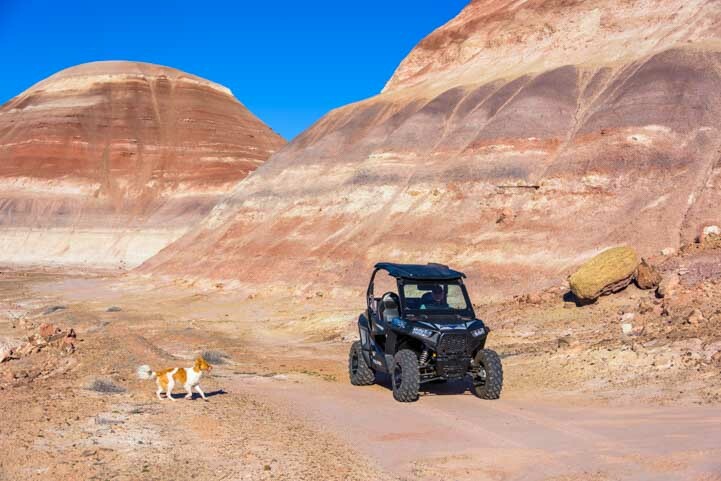 We got a few sunny days, and with the ground still damp from the recent rains, we enjoyed some dust-free rides on our Polaris RZR. 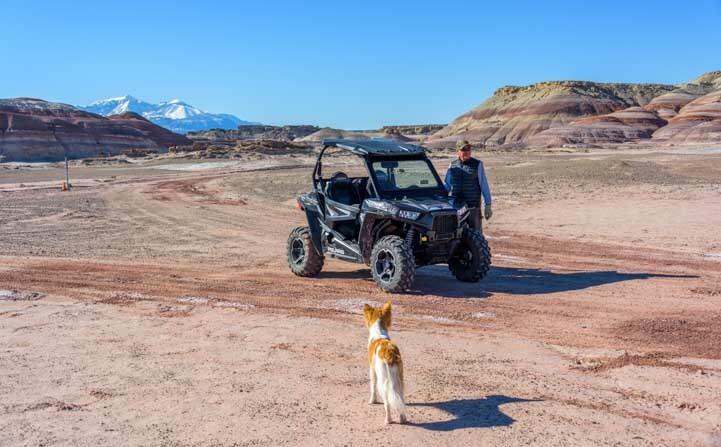 These UTV rides took us into the back country of Southeastern Utah where we went from one jaw dropping landscape to another. 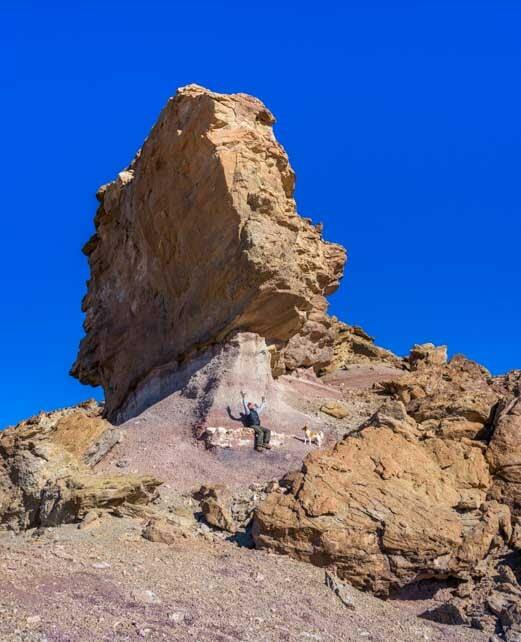 In some places the desert was flat and wide with immense jagged boulders balancing on the soft soil here and there. It’s easy to get lost in these rocks! 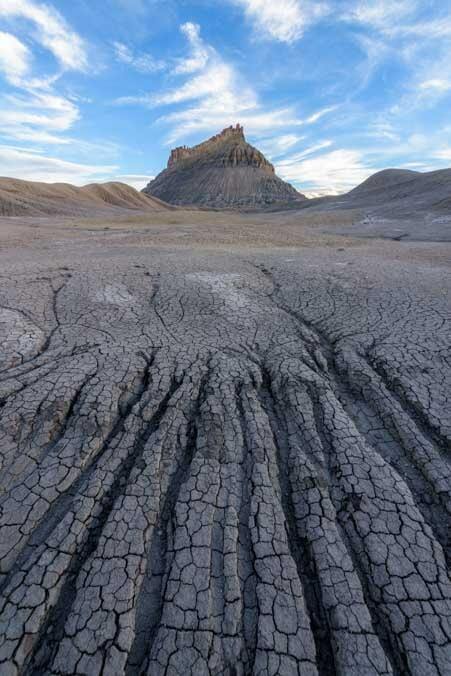 In other places vividly striped mounds formed a gently rolling landscape. “It feels like we’re on another planet!” We kept saying to each other! This land is so photogenic it’s hard not to take a photo with every step. And it is so whimsical and cheery you just have to strike a pose in a lot of shots too! Buddy watches Mark pose praising the heavens under a jagged spire. 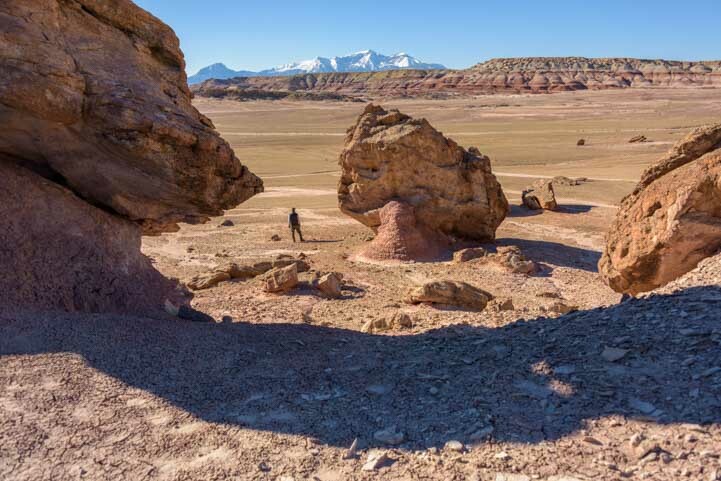 Utah’s breathtaking and otherworldly landscapes are beloved worldwide, and lots of folks from all over the place come to visit in large numbers between Spring and Fall. A huge labyrinth of a layer cake. 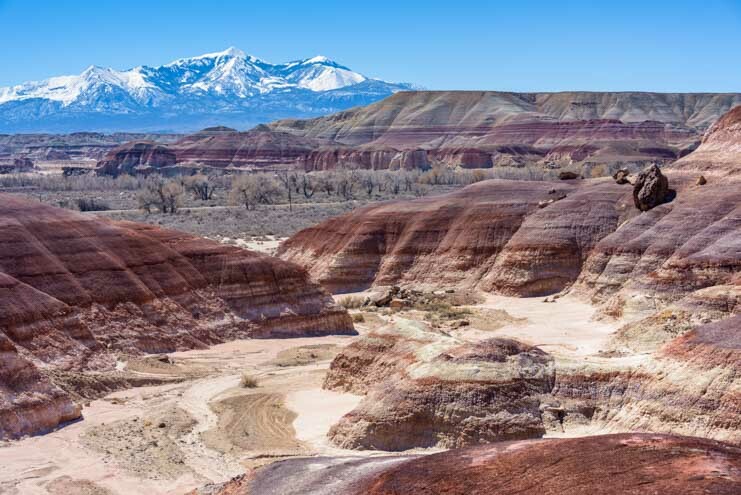 When we arrived in Hanksville, a massive and sweeping public land bill had just become Federal law with enthusiastic support from almost everyone in Congress. We hadn’t known anything about it, but as we talked with the locals we soon discovered they weren’t too pleased. 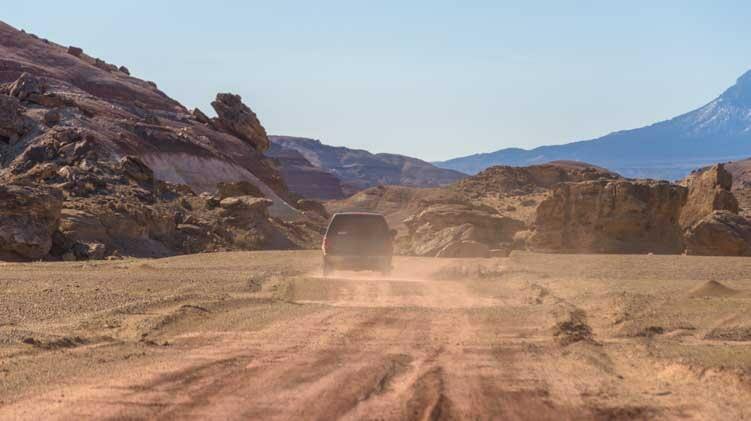 They were frustrated that motorized and mechanized vehicle access to some of the most popular places nearby will be prohibited because they’ll be designated “Wilderness” areas. Also, the locals hadn’t been notified of the bill until three days before it was voted on, so their views were never heard. 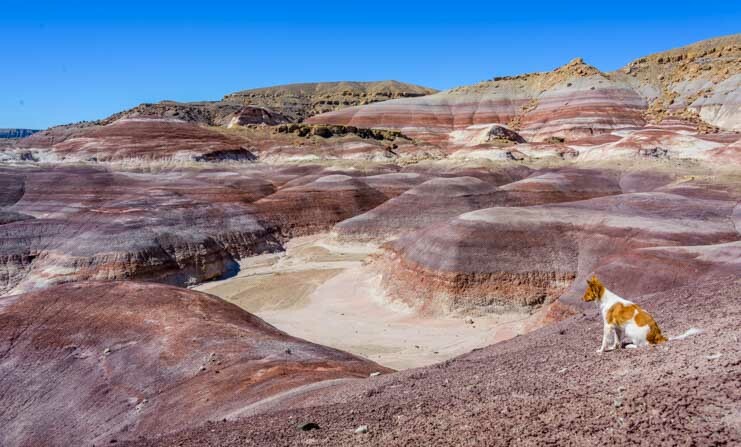 Mars…or BLM land in Utah? 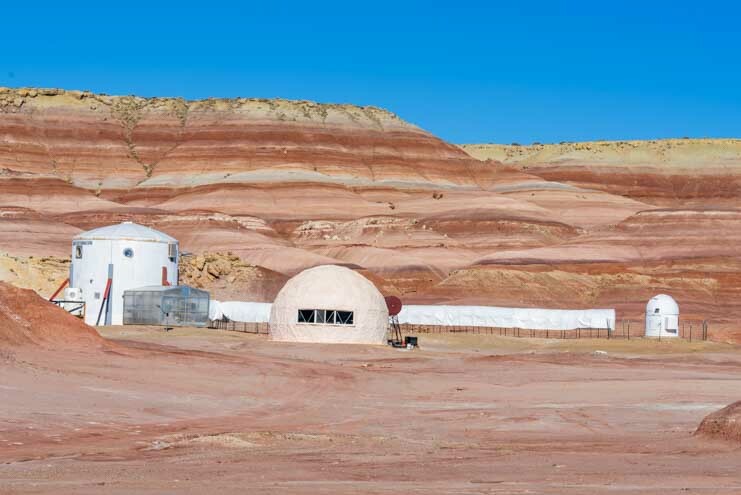 We stood by the sign and stared at the buildings lined up against the striped red rock mounds in the distance. 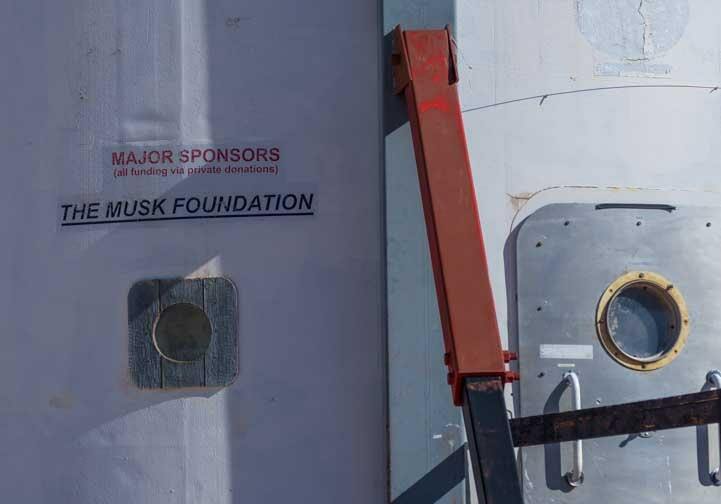 There was a collection of what can only be described as Mars Pods along with a large solar panel array installed on the ground nearby. We looked at each other in amazement. What in the world was this? We heard voices yelling in the distance and saw the door of the main pod opening and closing repeatedly as young, energetic people ran in and out the door. The yelling didn’t sound like English. I cupped my hand to my ear to see if I could figure out the language they were speaking, but I couldn’t tell. My first guess was Spanish, and then I thought I heard some French. There was lots of commotion in a foreign language. Suddenly, a side-by-side four wheeler came driving out from the pods towards us. There was no engine noise. It looked to be a Polaris Ranger UTV that had been converted to run on an electric engine. Then two more Mars Rover side-by-sides appeared behind it. The three vehicles zoomed passed us in a flash and disappeared down the road. One had the word “Opportunity” across the front hood, and they all had a pair of young folks in the seats. We decided to head into the compound and see if we could learn a little more about what this place was. Driving a short distance, we arrived at the main pod and were greeted by a friendly dog and a young man. “Private property.” He said with a strong accent. “I thought this was BLM land. Public land.” I said. “We’re borrowing it.” He told me. I asked if he meant they were leasing the land from the BLM, rather than borrowing it, and he nodded, and then I asked where he and his friends were from, and he said Peru. 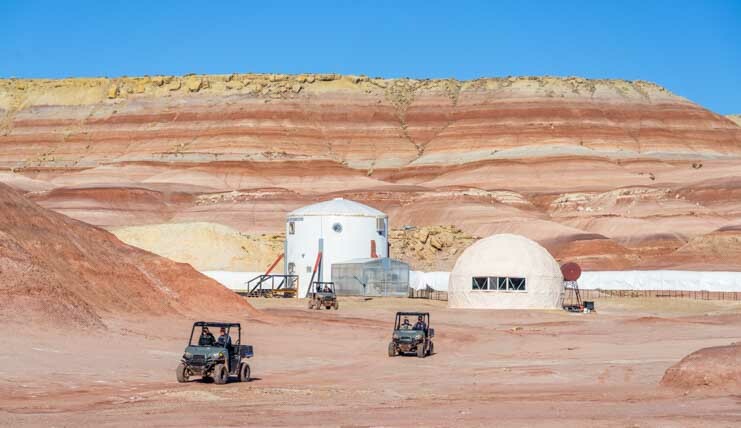 He went on to explain that international groups of kids visit this place on two week rotations to live in the Utah desert and drive around in electric UTVs so they can get the feeling of what it would be like to land in a desolate landscape on Mars and establish a human colony. We later learned that one of their current tasks is to fly teams of 8 drones at a time over the Utah landscape to make digital image maps. 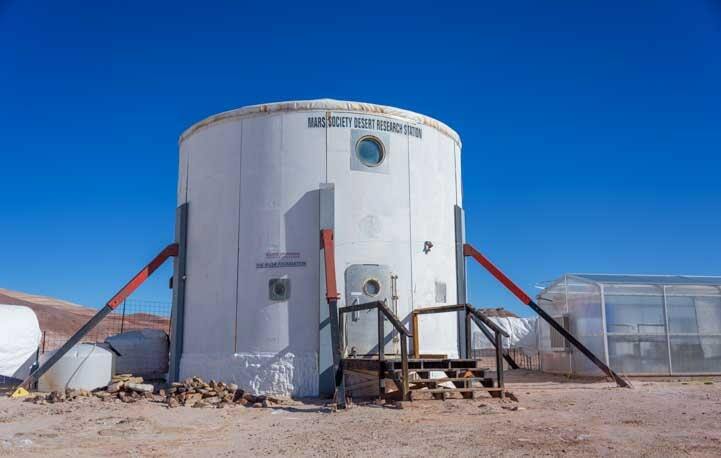 We also learned from some Utah Capitol Reef area tourist literature that describes this Mars colony that whenever the kids step out of the pods into the Utah landscape they are supposed to be wearing space suits just as they would on Mars. Curiously, we did not see a single space suit on any of the kids going in and out of the pods or driving the UTVs across the desert. 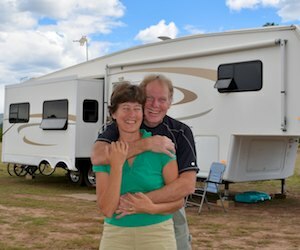 They were in street clothes and they looked no different than any other ATV/UTV owners who like to cruise around on dirt roads and go exploring. Future Mars colonists drive off into the desert in their UTVs to map the desert by flying teams of 8 drones at a time! Despite claims they wear space suits, they actually wore street clothes and looked no different than any other ATV/UTV group playing in the desert. As I’ve said many times before, the public land debate is immense and complex and there is a lot more to it than meets the eye. We continued on our own little safari at a modest 18 mph down the dirt road, lost in our own thoughts. Suddenly, a huge SUV came up behind us from the direction of the Mars colony at about 40 mph and swerved around us, narrowly missing the left side of our little open air buggy. The driver hadn’t beeped to let us know he was coming, and we were left in a cloud of dust. 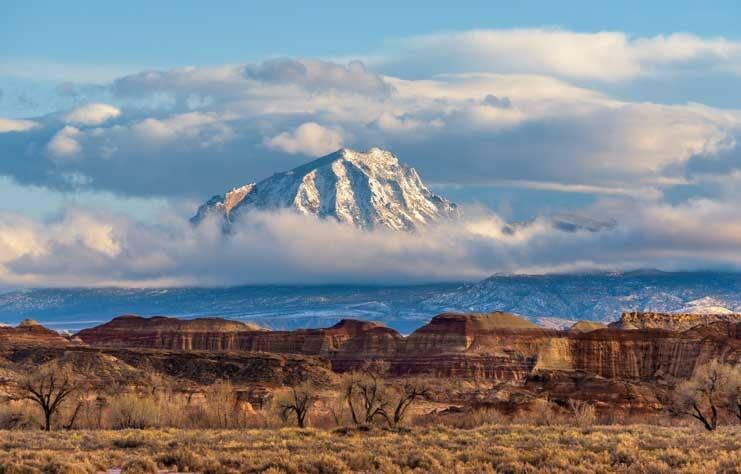 We had come Utah very early this spring to attend a photography workshop with Ian Plant that soon got underway. It was focused on how to take wide angle images that emphasize near-far contrasts. This was fascinating to study, and we had some outstanding experiences both in the classroom and out in the field. It will take us a while for us to master the techniques we learned, but we had a lot of fun starting to retrain our eyes to look for interesting patterns at our feet and combine them with interesting things in the distance. 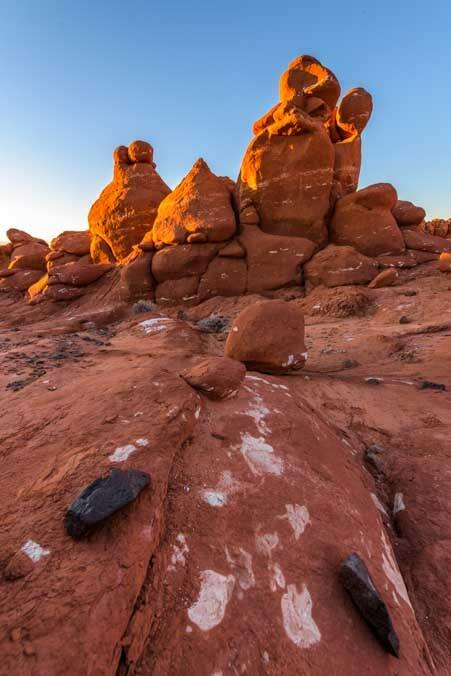 More practice with some red rock hoodoos at dawn. 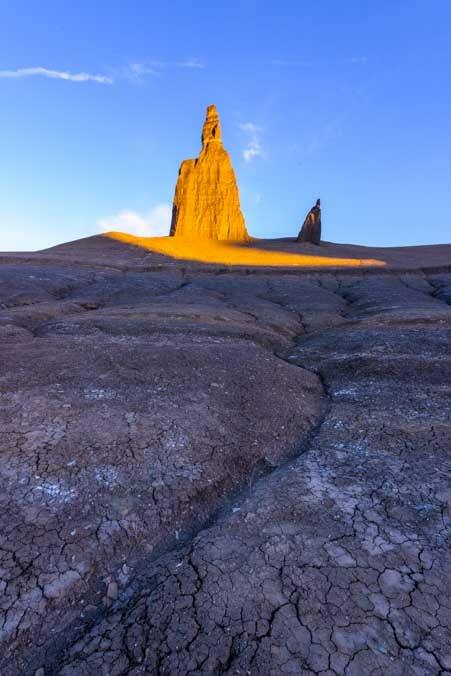 Early morning light envelops a distant pinnacle. 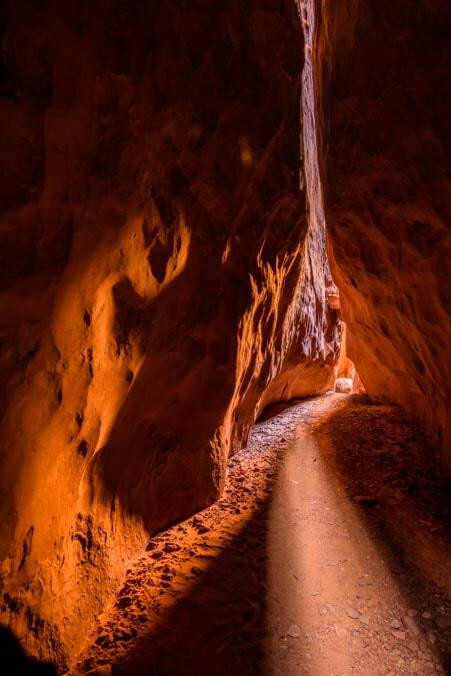 There are quite a few slot canyons in the area, and these proved to be wonderful for wide angle photography and playing with the shapes created by shafts of light. At one point our instructor, Ian, walked towards Mark as he was taking a photo. The light hit Ian perfectly and suddenly he looked like he was receiving a message from God or being beamed up to the USS Enterprise! 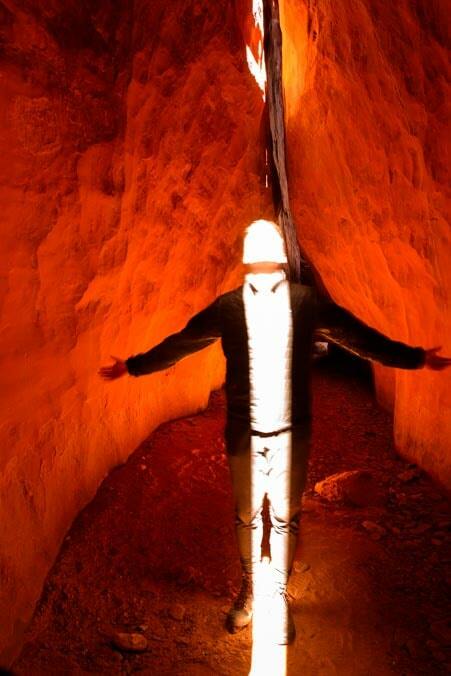 Mark also got a fantastic selfie at a slot canyon opening. 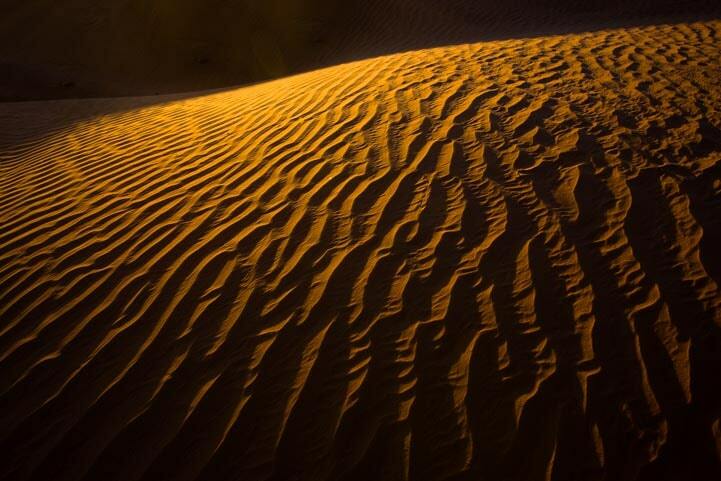 There are sand dunes in the area too. Talk about an other-worldy landscape! After the workshop was over, the rain and snow returned. We watched in awe as banks of black clouds came in. The snow-covered Henry Mountains were suddenly surrounded by swirls of clouds that changed shape with every passing minute. 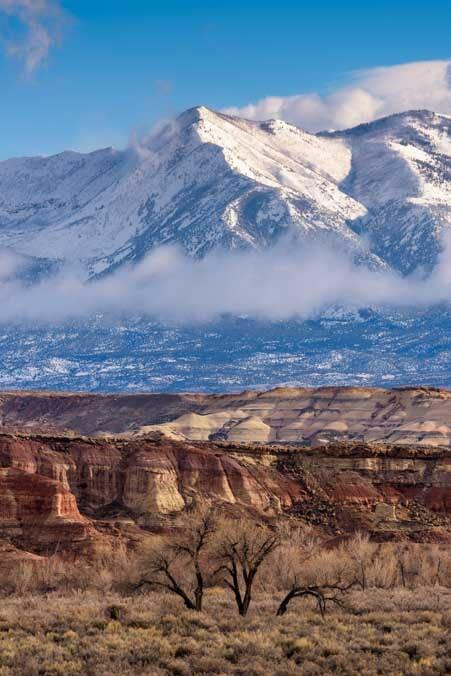 Snow-capped peaks above and red rocks below – Magic! The mountain was whisked away by the clouds…! 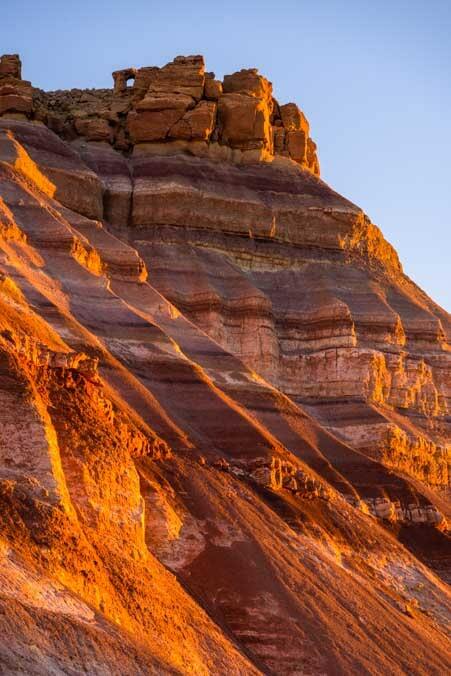 There is so much to see in southeastern Utah that we feel like we’ve barely scratched the surface despite several return visits. 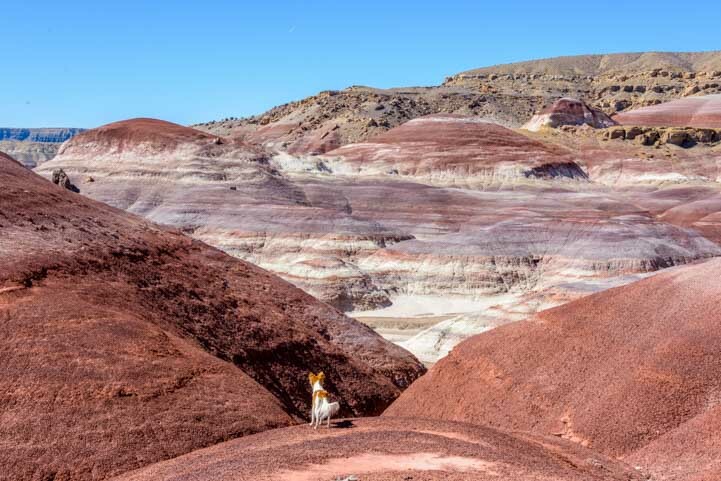 We think we’re headed back south to Arizona now to finish up a few things there, but the lure of these exotic red rocks and spectacular vistas will probably keep us here a little while longer! 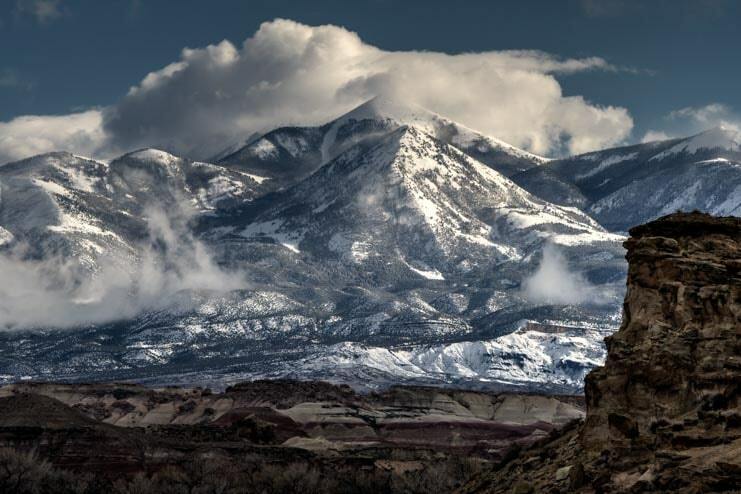 Southeastern Utah is a beautiful area. 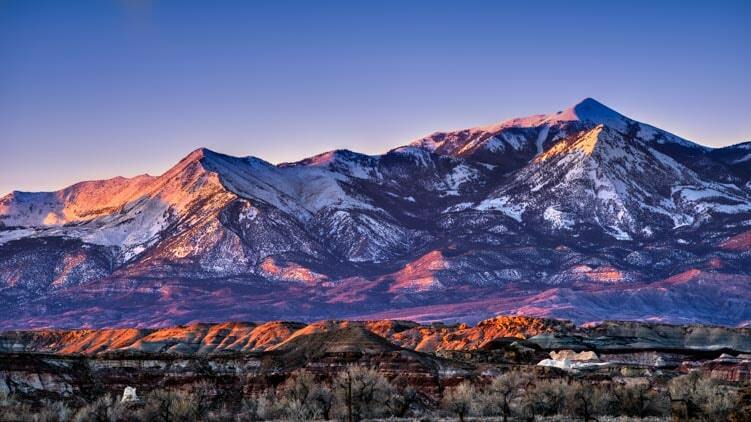 This entry was posted in Utah and tagged New, Travel, USA, Utah, Utah Southeast, Utah Southern, WP Travel by Roads Less Traveled. Bookmark the permalink. You never know what you’ll find in the desert, Bob. Next time it will be the martians themselves. In fact, we saw a lot of Martians in Roswell, NM, last time we were there!! Thanks for reading and appreciating our pics! The matrix? Some of us were assimilated 😳. Never-the-less, another fun and beautiful ride along. Some more great camera work you guys! This is worth many times the price of admission. Really love that last shot with the camper and the sun just peeking over the mountain. Wish I was there to see it. We still have a foot in the Matrix, Jeff. I don’t think it’s avoidable these days! But that still leaves us with one foot outside… We’ve been practicing with the wide-angle lenses here like mad, and I think we had one of those “aha” moments today and took a solid step forward on our learning curve. I love that twinkly shot of the rig too… such a happy little home (and no monotone ever!!)!! WHAT LANDSCAPES – and the new photo techniques show off the dramatic contrasts. Ian certainly pointed you in new directions !!! The scenery is spectacular and we have really been enjoying learning this new way of seeing, finding beautiful backdrops and then searching around at our feet for interesting things that point to them. The theory is one thing, but putting it all together in practice is a fabulous challenge!! Simply gorgeous! Emily, your photos and Mark’s are inspiring and always start my day off in a most delightful way. As always, thanks for sharing! Thank you, Mary!! Your kind words always put huge smiles on our faces. It means so much that you appreciate our artistic efforts! 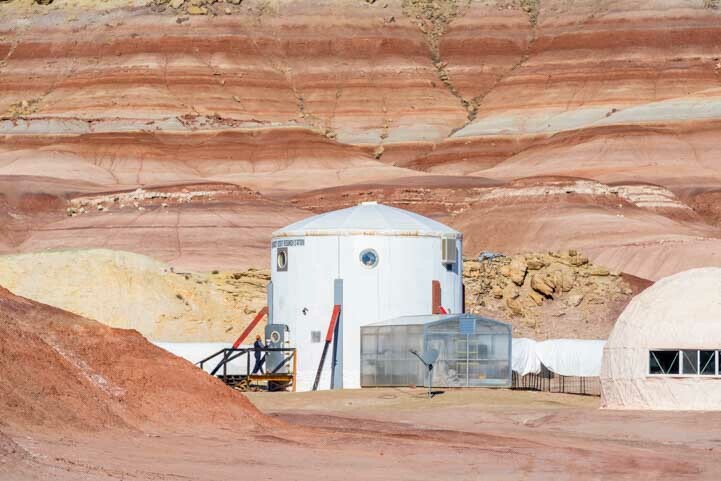 On Mars or in Utah? We just watched five BLM ranger trucks drive right by the Utah one a few hours ago. Maybe they’d be interested in a real one on Mars, though. LOL!! Fantastic photos Emily! Amazing how you manage to extract so much color from what could be perceived as a fairly washed-out landscape. Inspiring, thank you!! Thank you, Pete. 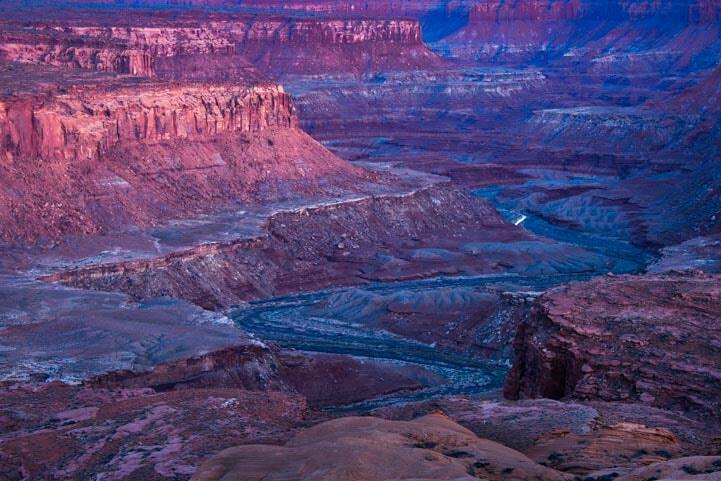 The landscape is rich with pastel colors if you look closely, and we find that are cameras make us look really close! Hiking without them we never see quite as much!